While shopping for tritium exit signs, you may have noticed the extended lead times associated with receipt of the product. Because of the rules and regulations related to the production of tritium exit signs, along with the limitations of a single operating supplier, lead time is averaging 12-24 weeks. If you are unable to wait this length of time to receive your signs, there may be an alternative for you. If you are able to run power to a unit, a traditional hard wired LED exit sign is the most cost-effective option. If you are not able the run power to the location of the exit sign, you may be able to use a photoluminescent exit sign. The following chart will help you determine if you are able to use this type of sign instead of tritium: Tritium Fact Sheet. If you’ve determined that a tritium exit sign is still your best option, get your order in as soon as possible! Fire Exit Signs, commonly known as exit signs, aid in the emergency egress of building occupants during a fire by providing a lighted version of the word EXIT. Federal, state and local building codes require fire exit signs in all public and commercial facilities. These building codes stipulate the installation locations and placement for fire exit signs throughout the building and the type of fire exit sign that must be installed. While all fire exit signs are required to be illuminated, not all models require electricity. UL 924 listed fire exit signs are available in AC powered, non-electric self luminous Tritium or photoluminescent models all of which are compliant for use in the United States and Canada. In the event of a power failure UL 924 listed photoluminescent exit signs are immediately visible from a distance of 50 to 75 feet. Current photoluminescent materials have a much longer and brighter glow compared to old materials, helping to speed evacuation during a lights-out emergency. This failsafe technology works without electricity. Photoluminescent exit signs are completely power free, requiring no electricity (AC) or batter power to operate. Since no electrical connection is required, installation is very easy. Plus, with no power consumption, no electronics, no batteries to replace and no bulbs to burn out or break, these signs provide zero operational or maintenance costs over the lifetime of the product. Industrial-grade photoluminescent tapes and signs are designed to withstand normal wear and tear, making them a reliable solution that is “always ready” in an emergency. Shortly after the tragic events of September 11th, the National Institute of Standards and Technology conducted an investigation into the evacuation process at the World Trade Center. According to the investigation, existing photoluminescent markings in the stairwells was one of the most commonly reported forms of aid in evacuating the buildings. As a result, the city of New York passed Local Law 26, requiring the installation of photoluminescent exit signs and floor level exit pathway markings in all commercial high rise buildings over 75 feet tall. Residential, hospital, hotel and educational buildings are installing photoluminescent exit signs and egress markings on a voluntary basis. We recommend photoluminescent fixtures and markings as a reliable, energy efficient and cost effective solution to prepare for a lights-out emergency in your facility. Are Tritium Exit Signs bright enough? While tritium lamps are not visible when normal lighting is on in a building, the UL 924 required contrast ration of the face color makes the exit sign very visible when the normal lighting is off. In fact, the brightness of a Tritium Exit sign is over double the minimum requirement set by UL 924. Are Tritium Exit Signs UL 924 approved? Yes, all tritium exit signs sold by The Exit Light Company have a UL 924 listing for exit signs. Which types of installations are ideal for Tritium Exit Signs? Tritium is a perfect choice when: there is not enough ambient light to charge a photoluminescent sign; there is no electrical power supply to the location; environments where electricity could ignite particles in the environment; where zero power consumption and no maintenance cost is desired. What is the real purpose behind lighted LED exit signs? Power outages occur in businesses, educational and medical facilities across the country every day. Are you prepared for such an emergency? 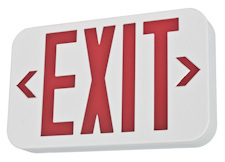 Many people think that the sole purpose of an exit sign is to mark stairwells and building exits. However, that is only a secondary purpose for lighted LED exit signs. The real function of lighted LED exit signs is to allow you to find the exit or emergency egress route in the event of an emergency situation. Many times a power outage can be the result of a fire in the building. In such cases, finding the emergency exits can be complicated not only by a loss of power but from the presence of smoke in emergency egress routes. Under these circumstances, lighted exits signs powered by rechargeable backup batteries can literally save lives by allowing individuals to safely exit the building. Most relevant codes (fire, building, health or safety) require exit signs to be permanently lit. The use of light-emitting diode (LED) technology provides brighter illumination than incandescent lamps, resulting in better visibility in a fire situation. LED exit signs also consume much less energy than traditional incandescent models, typically requiring about 4 watts of power to operate. This results in significant cost savings over the life span of the fixture, especially considering that LEDs have a very long life and may last for 10 or more years of continuous use. Is there an alternative to hard-wired Exit Signs? Not only can the installation of regular electric exit signs be very tedious but it can be very expensive too. Besides the cost of the exit sign, you also will need to hire an electrician who taps into your power system and installs all your signs. Is there an alternative? There certainly is! You have two other options to the traditional hard-wired signs to save time and money. Photoluminescent (power free) exit signs require no electricity (AC) or battery power to work. They are illuminated via photoluminescence (“glow-in-the-dark”). Since no AC connection is required, installation is incredibly simple and does not require access to conduit, an outlet, or the services of an electrician (minimal installation costs). Since no power is consumed, there is zero lifetime power consumption cost! Since there are no electronics or batteries, these signs also enjoy zero maintenance costs! Photoluminescent tape and emergency egress signs absorb and store energy from ambient light (requires 54 LUX -5-ft candles- of fluorescent, metal halide or mercury vapor light to charge material for 60 minutes). In the event of an emergency involving blackout or smoke-laden conditions, the photoluminescent product is immediately visible, providing a safe, illuminated evacuation path. Photoluminescent products can be installed easily in any location with sufficient ambient light source. 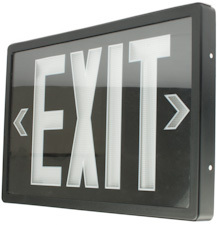 We carry a variety of photoluminescent exit signs to meet your specific needs. They require no AC power connection and require no ambient light source for charging. They are completely self-contained, relying on radioluminescence to illuminate the letters of the exit sign. Since no AC connection is required, installation is incredibly simple and does not require access to conduit, an outlet, or the services of an electrician (minimal installation costs). Since no power is consumed, there is zero lifetime power consumption cost because there are no electronics or batteries, these exit signs also enjoy zero lifetime maintenance costs! Tritium exits sign sales and disposals are regulated by the Nuclear Regulatory Commission and require End User Contact information before your order is processed. Not only do these two options save you power consumption and installation costs, but you can save on testing and replacement bulbs, as there are no bulbs to be changed or electrical components to be tested! In our current economy, many people are trying to save money and decrease costs. However, exit signs are required by most regulating agencies and cannot be overlooked. The Exit Light Company strives to provide customers with best possible pricing and quality products that will ease the strain this economy has imposed. Start saving now and we guarantee that you will be 100% satisfied with our environmentally friendly and low-cost products! The debate on how to save the environment has been going on for decades. Recently, new restrictions have been going into effect across most of the European Union in an endeavor to cut greenhouse emissions. The sale of incandescent bulbs has been banned across Europe. This is the continent’s latest effort to get people to save energy and fight global warming. Why the ban on incandescent bulbs? The reason for the ban is the E.U.’s goal of cutting greenhouse gas emissions by 20 percent by 2020. The E.U. is implementing new energy-efficient ways to save the environment. Everything from televisions to washing machines are starting to be made with this in mind. The E.U. is not the only country banning incandescent light bulbs. Australia has already introduced the new light bulbs and Cuba is only using compact fluorescent bulbs. In the United States, incandescent bulbs are planned to be phased out in 2012. James Kanter says: “E.U. officials sought to reassure consumers that they still would have plenty of choice, and that the changes would be gradual. The clear 60-watt bulb, one of the most commonly used, would remain available until at least September 2011, and clear 40-watt bulbs until 2012. E.U. officials said that they would find ways to push the industry to reduce the amount of mercury to levels around 2 milligrams per bulb from the current level of 5 milligrams per bulb.” But WWF, an environmental group, says standard halogen bulbs should also have been removed from the market. “Getting rid of incandescent bulbs is a no-brainer, but halogens are nearly as wasteful,” said Mariangiola Fabbri, a senior energy policy officer for WWF. For over 10 years The Exit Light Company has carried environmentally friendly products, most of which use LED lights that are even more efficient than fluorescent bulbs. Many of the products meet or exceed ENERGY STAR guidelines. All of the exit signs have an input power demand of 5 watts or less per face. The LED Retrofit Kits convert older exit signs which utilize incandescent bulbs into vastly more energy-efficient LED lighting. We ship our products using packaging made from 100% recycled polystyrene that meets Green Cross certification standards for post and pre-consumer waste content. The Exit Light Company not only has their customers in mind but the environment as well. The Exit Light Company is committed to providing emergency egress lighting and signage that is not only life-saving, but environmentally friendly. As a member of the U.S. Green Building Council (USGBC), a 501 (c)(3) non-profit organization committed to a prosperous and sustainable future through cost-efficient and energy-saving green buildings, we advocate the Leadership in Energy and Environmental Design (LEED) Green Building Rating System™, which encourages and accelerates global adoption of sustainable green building and development practices. The Exit Light Company sells a variety of products that are LEED® points eligible and can help your project or building become LEED® certified. Many of our products meet or exceed ENERGY STAR guidelines. All of our exit signs have an input power demand of 5 watts or less per face. Our Photoluminescent Exit Signs and Tritium Self-Luminous Exit Signs operate have absolutely no power requirements. We carry LED Retrofit Kits to convert older exit signs using incandescent bulbs to utilize vastly more energy-efficient LED lighting. We also carry a full line of Photoluminescent Tape & Photoluminescent Emergency Egress Signs for all your emergency sign needs. Finally, we ship our products using packing made from 100% recycled polystyrene that meets Green Cross certification standards for post and pre-consumer waste content. With your help, we can make a difference. Call us if have questions about how to make your emergency lighting or egress signage project more environmentally sound.